Migraine is a specific form of pain. About 2-10% of men and 5-25% of women suffer from the illness. Migraine causes a specific type of headache, which generally is experienced as pounding and one-sided in the head. A migraine attack on average takes between 4 and 72 hours. How do I differentiate between migraine and other types of headache? Migraine is not always easy to recognize. The illness, for example, often occurs together with tension headaches. Tension headaches are a type of headache which is caused by tense muscles. If you experience stress during an extended period of time, this can cause tension. After a while, however, this tension cause so much pain that a headache develops. How do I know whether or not I suffer from migraine? Migraine can be recognized at the hand of a few symptoms, which you can find below. Furthermore, tension occurs much later in the case of migraine, usually only just before or even during the attack. If you notice that your neck has been tense for a longer period of time, it is possible that you rather suffer from tension headaches. Migraine namely is rarer than tension headaches are. How do I recognize migraine? Types and symptoms? At least one of the symptoms above must occur in order for an aura to be considered present. Generally, these symptoms take about 60 minutes, after which an attack occurs. Did you know that even depressed feelings can be a warning sign for migraine? It is difficult to find a clear cause of the development of migraine. There namely are many different theories about the physical cause of migraine. What is often seen as a cause of migraine is the change of the process which has to do with the blood flow. Some research says that the blood vessels in the brain getting wider causes the migraine. Others say that the disruption of the blood flow itself is what is causing migraine. What is sure nonetheless, is that migraine contains a genetic compound. If someone in your family suffers from migraine, chances are increased that you can also experience migraine. Except for physical causes of migraine, there also is a category of psychological causes of migraine which can be very influential. It is known that stress and emotions can have a severe influence on the body. It therefore is not abnormal that stress and emotions can intensify migraine as well as cause it or increase the frequency thereof. Physical factors often are combined with psychological factors. For example, it might be so that the blood flow is disrupted by the experiencing of stress. Even unsolved emotions can cause migraine. Or, for example, think of a fear of migraine, which in turn can cause migraine on its own. The mind is a powerful tool and can bring a lot of positive as well as negative things about. Migraine treatment? How do I handle migraine? There are different techniques available nowadays to treat migraine. First off it is useful to get migraine diagnosed. To start a migraine treatment, it is useful to know whether or not migraine is in fact at play. Otherwise it is likely that the treatment will not be very effective. Secondly, after determining the diagnosis, you can start looking for treatment. This often happens at the hand of medication, prescribed by a neurologist. This neurologist is authorized to diagnose you and to prescribe a suitable amount of medication. This can reduce and eventually eliminate the migraine. However, there also is a way to reach the same effect of medication without taking medication. There are techniques which can help you to treat the causes from the root. This reduces chances of getting migraine and also increases your resistance. If you namely suffer from migraine frequently, the body is weaker and can offer less resistance to both illnesses as well as migraine. If you then make your body stronger, you do not only increase your pain threshold, which can lead to getting migraines less often: you also decrease the chances of migraine happening in general. The above can be done at the hand of therapeutic techniques. 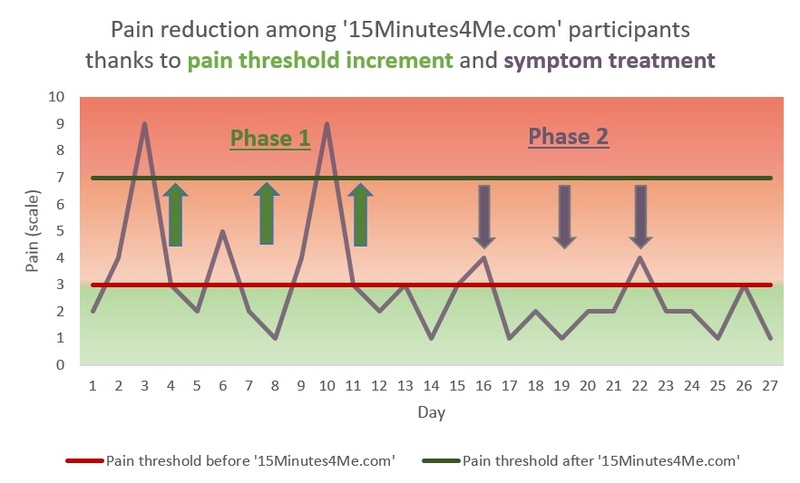 “15Minutes4Me.com” is a self-help program which was developed by doctors and psychologists. It has the goal of activating people and to together look for what helps you! Would you like to know what causes your migraine? Would you like to know what influence migraine has on your life? Then take the free stress induced pain test here!